Microsoft plans to improve the built-in system reset options of the Windows 10 operating system with the release of the Creators Update. System reset is a feature of Windows 10 that users may invoke from Settings > Update & Security > Recovery > Reset this PC, during Advanced Startup, and by running the command systemreset -cleanpc directly. The current version of System Reset gives you two options. You may "remove everything" and start fresh, or select "keep my files". The former removes everything including personal files, the latter will preserve personal files but remove anything else. The two options have been taken directly from Microsoft's Windows 8 operating system which features the same options. The two main options have not changed in the latest Windows 10 Insider Build. In fact, if you run System Reset from the interface, you will still get the same two options that you can pick from. If you do run the systemreset -cleanpc command however, for instance by typing it in the start menu, the run dialog box (Windows-R), or the command line, you will get only one option. 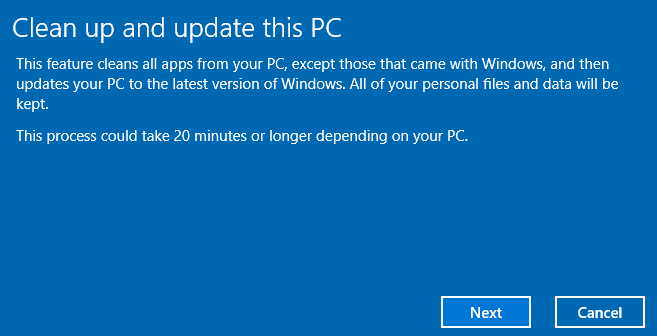 That option is new, and called "clean up and update this PC". The screenshot above shows the new option's prompt when you run the command. This feature cleans all apps from your PC, except those that came with Windows, and then updates your PC to the latest version of Windows. All of your personal files and data will be kept. This process could take 20 minutes or longer depending on your PC. You are probably wondering how this differs from the current options. Both options that are currently available reset the PC to its factory default state. This new option seems to do that as well initially, but it will also download and install updates that are available for the PC to bring it up to date by installing the latest patches for the system. So basically, what the new option does is update the PC to the latest version after the reset. The new option is not yet integrated into the system reset selection menu. Since Microsoft did not advertise or list the new option under the changes list of the recent build, it could mean that the feature is not yet ready for that. I found the system reset feature never that useful, as it failed to work properly in the past every now and then. I prefer to create backups instead and restore those when the need arises. Now You: Did you use System Reset in the past? Any idea how it works on Windows 10 machines upgraded from Windows 7? I really need to clean install windows 10 on one of my upgraded PCs but I am scared of losing license information and never to get back to Windows 10 (for free) again. Such incidents have been reported on cnet forums. Any idea how it works in such scenarios? No difference between an upgrade and a clean W10 install. If your current License of Windows 10 is currently activated, you can freely do a clean install as it will re-activate itself as Windows servers know that your computer was previously activated with Windows 10. I wonder how many customers on slow DSL ~1 mbs download speed, will choose this and then realize that it’ll take days to download a clean image. This is something that Microsoft needs to make very clear. 150+ mbs will download the image in minutes, 1 mbs will take over 100 times longer. Our shop has had many people come in to complain about the slow updates on Windows 10. My first question is “do you have Frontier DSL more than two miles from the Frontier office.” The answer is usually yes. @ seeprime ……. Factory Reset in Win 10/8.1 is done thru a Recovery Partition stored in the cptr’s hard drive, ie there is no downloading of a clean Win 10/8.1 image. It usually takes less than an hour to complete. 30000Mb/1Mbps = 30000 seconds = 30000/60 minutes = 500 mins = 8 hrs 20 mins. The Threshold Update, Anniversary Update n the coming Creator Update r the same size as a new Win 10 Version iso file, ie about 3GB. The Dec 2016 Cumulative Update for Win 10 is about 900MB for 64bit or 500MB for 32bit. It will take a few hours for a 1Mbps Internet plan to download the update. So, Win 10 is mostly not recommended for those who hv 1Mbps download speed or less, n those with low Data Caps. The best way to reset a computer is get an ISO from TechNet and upgrade Windows 10 Pro to Windows 10 Pro. It keeps all of your third party software intact so you don’t have to spend two days installing and typing key codes to authenticate. Why go thru the trouble if you can just clean install it from USB/DVD? The license is then automatically pulled from MS once your hardware “hash” has been recognized. No need for such nonsense to get rid of all apps. Just re-install. It’s not nonsense just because it’s misunderstood. It’s just another way of doing the same thing. It should have an option to clean install Windows 7 or 8.1 and remove Windows 10!